The Moto X Force is packed in a rather big and fancy box, but don't be fooled by its size and looks. The TurboPower fast charger is the only thing you get other than the Moto X Force itself. And that is if you are lucky, as there are markets where the box contains nothing but the phone. There are no bundled earphones or a microUSB cable. 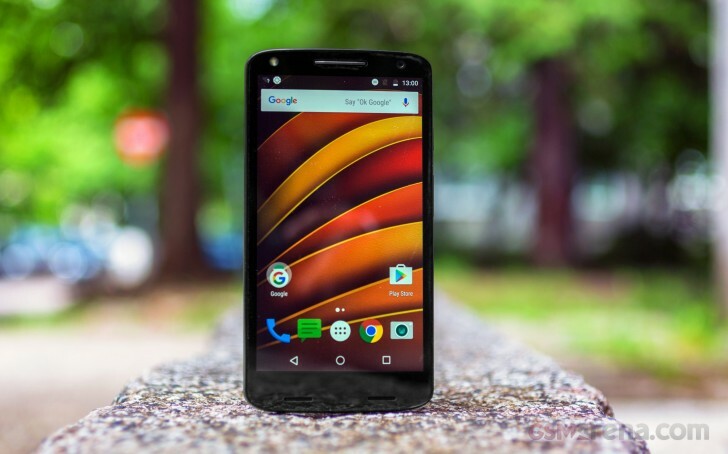 The 5.4" Moto X Force is far from compact. It measures 149.8 x 78 x 9.2mm and weighs in at a solid 170g. It's as tall as the 5.3" LG G5, but half a centimeter wider and 1.5mm thicker. It's a big and stocky bloke compared to some elegantly slim smartphones, but not unpleasantly so. The Moto X Force is built to last and you can tell by the hand-feel and the solid impression the very first time you unwrap the smartphone. The matte metal frame with chamfered edges holds everything together, not without a sense of premium style. The front is quite restrained but the back is where things get interesting. 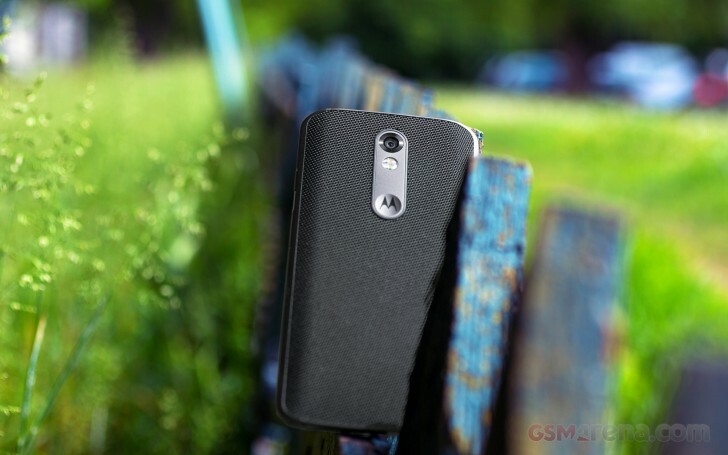 The standard (read non-customized) model of the Moto X Force comes with a back made of the so-called ballistic nylon. It's incredibly grippy, with an excess of industrial look and feel to it, yet quite controversial in terms of a flagship-grade finish. It feels extra strong, reliable and durable but, frankly, kind of cheap. The funny part is it probably isn't. Ballistic nylon won't scratch or break, as it's very durable and does a great job at absorbing shock from falls. If we are to zoom in close on this thing, we'll actually find real threads and tiny knots of it, as opposed to the faux-leather looks of what's actually plastic. You can tell this thing is far from a cheap knock-off and should work as advertised. The only real concern about the ballistic nylon is that it's prone to gathering dust and other tiny particles, which are quite tough to remove once stuck between the knots. So, the back is covered by a rather durable and grippy piece of ballistic nylon. The sides are made from metal. What about the front? Motorola has shielded the entire front with a shatter-proof piece of glass and gives it a 4-year warranty. Yes, that's right - even though the standard warranty stretches only over 1 or 2 years, your front glass comes with a full 4 years worth of warranty and will be replaced if broken by an accidental drop or similar. Scratches on the glass or damage to the handset itself are not covered by the warranty, nor is the phone covered against intentional or unreasonable amounts of pressure exerted on the glass. The Moto X Force features a water-repellent nano-coating that protects its internals from moderate exposure to water such as light rain, accidental spills or splashes. It will most probably survive a quick dip in water too, but the phone is not water-proof and Motorola clearly states that in its brochure and warranty conditions. This means no water pictures as the Moto X Force will be damaged and you won't get a new one. As you can see, Motorola protected the Moto X Force against the accidents which may occur in daily usage, but it isn't an adventurer's smartphone. It's just tough enough to survive four years, and you don't need to handle it with care as you would do with other, glass-covered competing flagships. Speaking about handling, the Moto X Force offers a secure grip thanks to its ballistic nylon back and matte frame. It's solidly built, but quite chubby so single-handed operation is mostly a no-go. It slips easily in most pockets but the weight of a 5.4-incher will certainly be felt. There is nothing out of the ordinary as far as the Moto X Force controls are concerned. Above the display is the earpiece flanked by the front LED flash and the 5MP selfie snapper, while the bottom has the rather large microphone and loudspeaker grilles. We noticed that the three speaker grilles tend to collect dust and grime easily so this may become an issue in time. There are two infra-red sensors around the bottom grilles, very well hidden beneath the glass. Those are used to detect your hand when you reach out for your phone, so they could turn the Moto Display on, if you turned the feature on. The top of the phone houses the audio jack and the SIM/microSD cards tray. The bottom has the lonely microUSB port. There is nothing on the left while the right is pretty busy - the power/lock key is placed above the volume rocker. This is a rather odd sequence and it took us a while to get used to clicking the power key instead of volume up/down. The good news is the lock key has a nice texture on its surface, which helps with tactility. Finally, the metal plate on the back highlights the 21MP camera lens, the dual-tone flash, and the signature M logo. As usual, the logo is indented so your index finger rests perfectly there during calls. Just don't expect to find a fingerprint scanner or a key at this place if you are coming from a Huawei or an LG phone. The secondary mic hole is just above the camera, drilled in the ballistic nylon. It's camouflaged very well, but at times, it can fool your eyes it's a manufacturing imperfection.